A fibreglass cow which flew 500 metres above a quarry lake in Snowdonia at speeds of 100mph has raised money for farming charities. 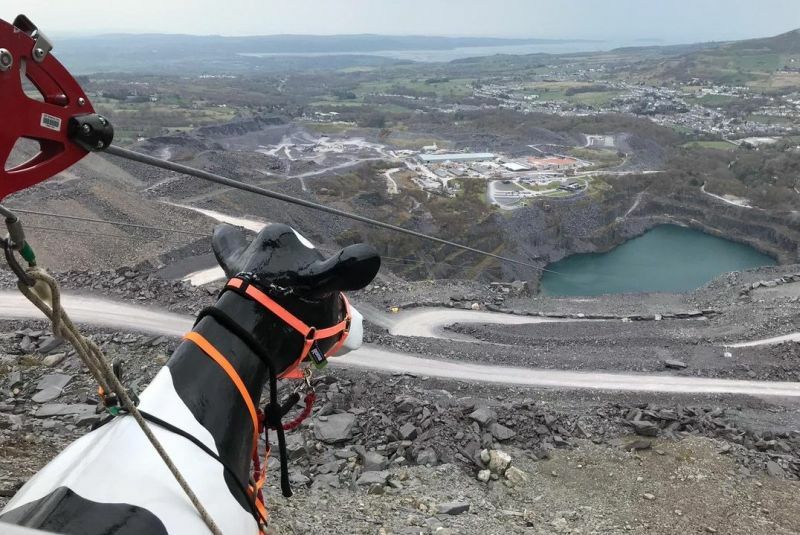 'Bessie the cow' flew down the UK’s fastest zip line at Zip World’s Penrhyn Quarry in Snowdonia earlier this week. Educational group Cows on Tour were behind the stunt. They aimed to raise funds to support farming charities the Royal Agricultural Benevolent Institution (RABI) and the DPJ Foundation. The group is made up of Welsh farmers and has been running for five years. Recently, they launched a ‘Wooden Cow - Grow your Own’ competition for schoolchildren. Group chairman Matthew Shervington-Jones, Welsh TV channel S4C’s Ffermio presenter Meinir Howells and RABI Monmouthshire committee member Kate Beavan flew alongside Bessie above the bright blue quarry lake. Wyn Evans, NFU Cymru Livestock Chairman, and Seimon Thomas, Royal Welsh Show Pembrokeshire County President, were among those who also braved the zip line, which can reach speeds of 100mph. Unfortunately, Bessie’s weight and size meant her trip was much slower and she wound up getting stuck a few metres from the end. Matthew said: “We had an amazing day at Zip World, joined by a great team of people representing agriculture, our invaluable network who support farmers daily and of course the staff at Zip World who made our challenge happen and kept our cow safe. RABI is a welfare charity which changes farmers lives for the better. It offers financial support to farming people in hardship of all ages. The DPJ Foundation is a mental health charity which supports people in Wales in agriculture with mental health problems.